SmartDO focuses on the direct global optimization solver, which does not need much parametric study and tweaking on the solver parameter. Because of this, SmartDO has been frequently customized as the push-button expert system. Combining Tunneling and Hill Climbing to jump out of local minimum. Automatic response smoothing on mesh discretization and other numerical noise. Automatic recognition of active constraints. Much more efficient and stable. Smart Dynamic Search to automatically adjust search direction and step size. The Genetic Algorithms in SmartDO can be used to solve problems not suitable for the gradient-based solver. And the Gradient-Based NLP solver provide a more efficient and accurate way of getting the optimum. These two algorithms together make SmartDO a practical and powerful optimizer. Automatic Population and Generation Number Calculation. Adaptive and Automatic Cross-Over Probability Calculation. Because there are various types of design variables available in the Robust Genetic Algorithms of SmartDO, the users can perform Concurrent Sizing, Shaping and Topology Optimization in a stable and efficient fashion. The problem of Concurrent Sizing, Shaping and Topology Optimization usually requires intensive numerical effort. With the Smart Heuristic Search Technology, SmartDO is able to avoid unnecessary calculation and save considerable amount of computational time. For all the solvers in SmartDO, there is no theoretical and/or coding restriction on the number of design variables and/or constraints. Powered by its Direct Global Search techniques, SmartDO can start from an infeasible design point, pushing the design into the feasible domain first, and then proceed with optimization. SmartDO uses Tcl/Tk as its basic platform, which makes its architecture highly open and user programmable. In today's competitive environment, the user programmable features allow you to differentiable with your competitor, and accumulate your know-how and experience in the script. 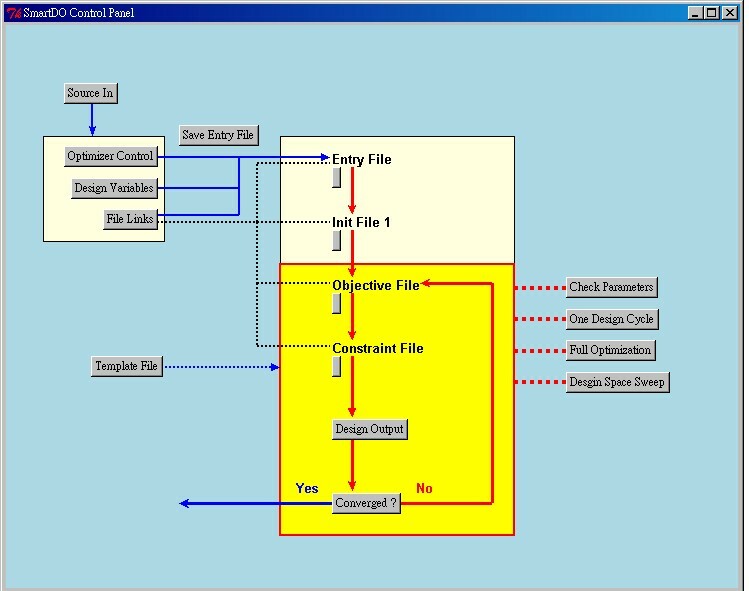 With Tcl/Tk, the user can import add-on packages, and also develop GUI, Graphics and plotting in SmartDO. SmartDO is highly error tolerant. The user can usually restart from where the calculation is interrupted, in case of unpredicted incident or system shutdown. SmartDO can also ignore the noise or nonconvergence during the CAE analysis without human judgment. SmartDO offers versatile interface to interact with external CAE packages. 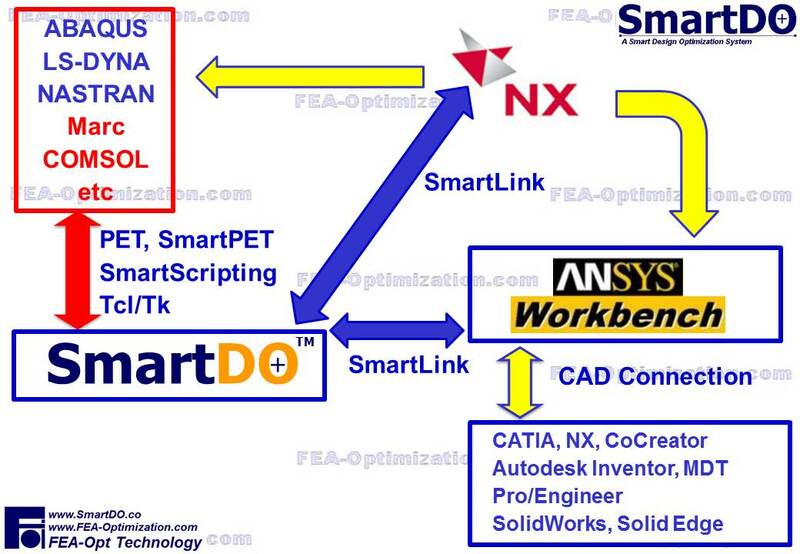 SmartLink can link with the parameters in ANSYS Workbench and NX CAE directly with easy-to-use GUI. 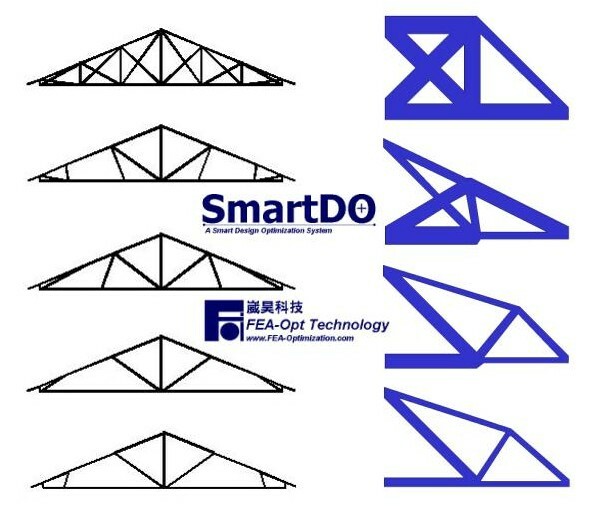 With the powerful solver in SmartDO, the user can cross link any parameters in Workbench to any design parameters in SmartDO, such as design variables, objective function, and constraints, and SmartDO will usually solve the problem smoothly without much difficulty. Bulit-in Tcl/tk engines enables standard Tcl/Tk and many extensions. PET (Preprocessor for Embedded Tcl) and SmartPET let the user insert Tcl script into the text input file of ANY package that does not support Tcl. SmartScripting is a GUI for generating Tcl/Tk script automatically. The user can access the programmable feature of SmartDO by answering questions in the SmartScripting GUI, and SmartScripting will generate Tcl/Tk scripts accurately with convenience.